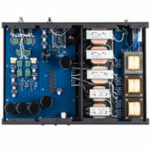 [W]hen I reviewed the Melody Valve PM845 mono block amps and Pure Black 101 preamp, I was knocked out by the build quality and no-holds-barred approach to amp construction. Just going by weight, appearances and parts count, they are seriously impressive products. My final conclusion was that the 845 output tube, which surely looks great, and has plenty of power, is too much of a burden to winding a good output transformer. The PM845, but not the 101 preamp, was slightly darker than neutral, and didn’t have the same level of transparency of a 300B or 6c33c amp. I’ve heard similar problems with other transmitting tubes, so this isn’t a problem just for Melody Valve. 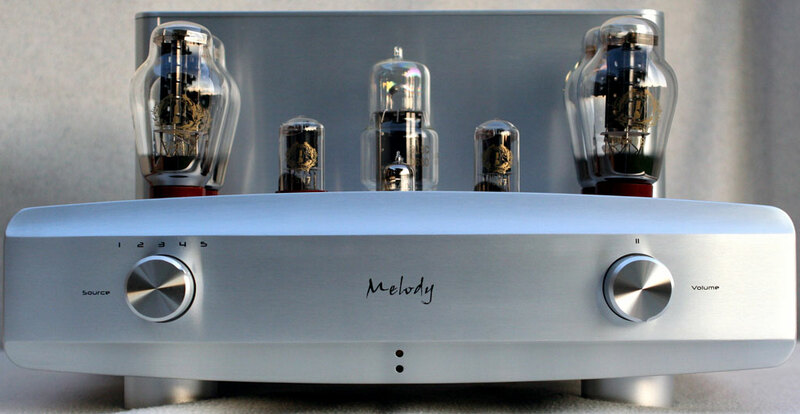 Hugh, the U.S. importer for Melody Valve, wanted me to hear their 300B products, so he forwarded something completely different from the PM845/Pure Black 101 combination, the AN300B integrated amp. Compared to the bacchanalia of transformers and tubes of the PM845/PB101 combo, the AN300B is a minimalist exercise. There are four 300B, two per channel, two 6sn7, one each per channel, and a single 12at7 providing gain. The rectifier tube is a new one to me, the 5Z8P. The AN300B is finished in brushed aluminum, with wooden sides. Though input selection is done the old fashioned way, by turning a knob, there is the provision for a remote control for adjusting volume. Judging by feel, the AN300B is every bit as solid as a single PM845, though not as back-killingly heavy. Though the signature gloss black finish of the PM845 is extraordinarily attractive, I welcome the easy-to-keep clean brushed aluminum, which does not show fingerprints and dust like the gloss black finish. In size, weight, exterior finish, heat production, tube cost, operating cost and purchase price, the AN300B is eminently more practical than PM845 and Pure Black 101 combination. I could launch into a long dissertation on why a transmitting tube amp, like the PM845, is more complicated than a 300B amp, but I’ve already done that. One thing I don’t think I touched on is that the transmitting tubes, such as the 845 and 211, need a lot more voltage and/or current for drive power because the output transformer has to “step down” the transmitting tube’s output voltage two to three times as much as a 300B, or other low impedance triode. When you step down a signal to go from high impedance (the tube side) to low impedance (the speaker side), you lose amplification because the amplitude of the signal, the AC voltage, gets smaller. Therefore, you need to drive the output tube with a lot more voltage. 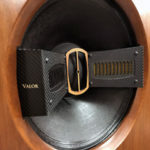 The higher power to drive a transmitting tube might be accomplished with a transformer, or a fancy tube circuit, but both add complexity to the design and high complexity adversely affects sound quality. The AN300B is much simpler because the 300B doesn’t run at very high voltages, and doesn’t require high power input to get full output power. The entire design becomes much easier to perfect. Instead of resorting to a bigger tube, or push-pull output, the AN300B uses two 300B’s in parallel to get useable power. 22 watts is sufficient for moderately efficient speakers, small rooms, undemanding source material and young ears. Compared to the PM845, the AN300B is 5-6dB softer. Without the extra 300B output tube, it would be 8-9dB softer. That starts to get very noticeable if your room is large, and/or your speakers are “only” moderately efficient, or you are 40 years old and you enjoy demanding music, just like me. I’ve used a 10-watt amp, but it required horns to make up for the loss in power. With the AN300B, there was enough power to allow me to listen to anything in my collection. To some, the idea of parallel output tubes is anathema, just as push-pull is anathema, indirect heating is anathema, the transistor is anathema, etc.., etc… In my experience, in a properly designed circuit, parallel active devices aren’t easily heard as such. There are some very complex circuits with multiple parallel devices that lack clarity, but that has more to do with the complexity of the circuit: the number of stages, the inclusion of cathode followers, coupling capacitors, and so-on. A comparison of the same amp circuit, minus the extra pair of tubes, would be instructive, but having half the power could just as easily skew the results against the lower powered amp. Instead of worrying about push-pull versus parallel, versus high voltage transmitting tubes, versus flea-powered purity, first determine how much power you need, and use that to narrow your choices, preferably including a variety of topologies and technologies. I’ve reviewed quite a broad range of tube integrated amps, and they all have a very distinct sound. The AN300B, just like those before it, has character. What immediately grabbed my attention was grace and fluidity. The sound was never unnatural, even when the music was jarring. Like a handful of similar designs, all sporting 12-25 watts, nothing about the AN300B was mechanical or artificial. The frequency response is excellent. With 300B output tubes, the output transformers are easy to wind, plus the drive circuit is simple. The result is wide bandwidth. Even with a modest 22 watts, I could feel extremely low bass; the highs extended well past audibility, without audible phase distortion. I knew that the AN300B would have better frequency and phase response than the more complicated PM845; it’s the price you pay for the big, single-ended power. It would be a much bigger story if it did not have good extension. Distortion, unless I was driving it into clipping, stayed very low. On solo instruments, the Melody Valve AN300B is a thing of beauty. The overtone structure of instruments like the clarinet, baritone saxophone and cello was accurate. Noise and distortion stayed remarkably low on small ensembles and vocal tracks. The hallmark of the 300B output tube is how well it handles a complicated signal without creating gross intermodulation and ugly odd-ordered harmonic distortion. When pushed hard the amp did distort, but the nature of the distortion was benign; you won’t notice it until the amp is audibly compressing. Going full-throttle, it never really “crapped out” like most push-pull tube amp. The AN300B goes as far as it can go, which is around 22 watts, and then it negotiates with you. “Well, I can’t give you 100 watts, so I’ll turn this bass peak into a nice grassy hill instead of a Pike’s Peak, compress the rest of the dynamic range, and give you a little 2nd harmonic distortion to let you know I care”. It might not test as good as many amps, but the actual performance is very faithful to the source, as long as power doesn’t become an issue. As you might guess, dynamics, especially microdynamics, were very strong. As far as I’m concerned, this is where a zero-feedback, class-A amp excels. The AN300B is a snappy sounding piece that keeps your foot tapping and head nodding. Even when playing loud, it recovers faster from dynamic peaks than amps with feedback; this is probably due to the nature of the Class A output stage. Class A designs are running full power all the time, and do not have to “recover” their power supply reserve the way a Class AB amp would. It’s a recipe for good dynamics: No recovery is necessary for the power supply; dynamics aren’t muddied by the time-lag created by feedback. It measures well against any other 22-watt amp I’ve heard, and actually sounded like a much more powerful amp on some material. Because of its simple circuit, low noise, low distortion, good detail, good frequency response, and good phase characteristics, I heard excellent imaging. Instead of coming from the speaker as piercing beams, the sound came out as true waves. The shape of the notes, and of musical lines, was not mechanical or disjointed. Solid images appeared well outside and behind the speakers, while maintaining a good center image. I didn’t get to hear the AN300B as long as I would like. I messed around, didn’t get serious until the last few weeks, and now I’m kicking myself. This amp acquits itself at every criterion I have. Even with moderately efficient speakers in a large room, it did just fine with most music I tried. In a smaller room, or with some full-range horns, this could be the bee’s knees. Melody Valve should be proud of the products they manufacture (and I bet they are proud!). Across their range, everything is built with great attention to detail. A significant investment goes into the parts, assembly labor, manufacturing processes, testing and packaging. If you had any doubts about their stability or staying power, you can rest assured they are for real. This is a fine amplifier, at a very reasonable price. I recommend you look at it, and the rest of their products. 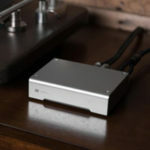 Great write up of the amplifier – I have a couple of questions. What speakers did you pair these with? Also, when it comes to the step-down of the 211 amplifier, does driving the output tube with more voltage decrease the life span of the tube? Or does it add more distortion from the high voltage or cause more distortion when it is stepped down? What is the down side? And, if you pair the amplifier, I believe Melody’s AN211 is 16W, with very efficient speakers, is there really a downside? Good questions. My speakers are relatively efficient, though their load is complex. This particular amp, because of the parallel 300B, can drive difficult loads (the output impedance is low-ish, and damping is good). 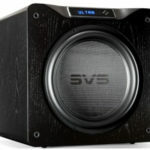 The speakers are GR Research Alpha LS, large line sources that are no longer in production. The question you asked on the 211 has a lot of “it depends” involved. Generally speaking, if you drive the 211 with enough voltage, it switches from class A1 to class A2, where the driving tube is supplying current, which adds to the output power of the amp. However, that depends on how the driver tube is connected to the output tube–if there is a transformer between the two, then class A2 is very possible. So, if you have a 211 amp with 15 watts nominal for class A1, and it is being driven by a triode connected EL34, and the EL34 is driving the 211 hard enough, then the 211 starts to draw current from the EL34/transformer combination. The power adds to the 15 watts, so if it is being driven by 3 watts from the EL34, then the output would be 18 watts, class A2. Yes, driving any tube into “grid current”, or class A2 or AB2, will put much more stress on the tube. In A2, the tube is putting out as much power as it possibly can, then drawing additional power from the driving tube. That causes the grid to heat up, and for the plates to get hotter than if it were idling in class A. 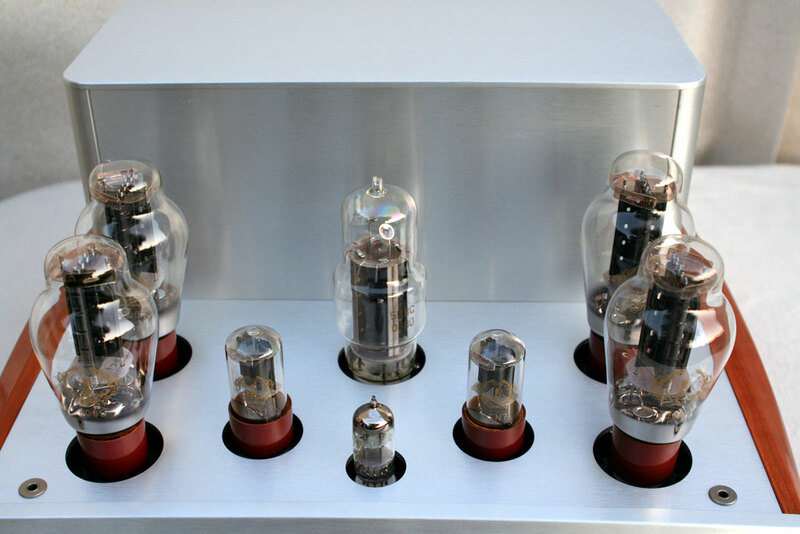 Generally speaking, distortion increases with higher drive from the driver tube, unless it is carefully engineered, running Class A, and using very linear tubes and parts. If everything is “just right,” distortion can be inaudible all the way to full output. The wider the transformer ratio, the more losses there are in a transformer, and more distortion, though transformer distortion is very sneaky. If you have an extremely efficient speaker, use the 300B, 2a3, 50, 45, 10y, px4, etc.. The cult following is legitimate. 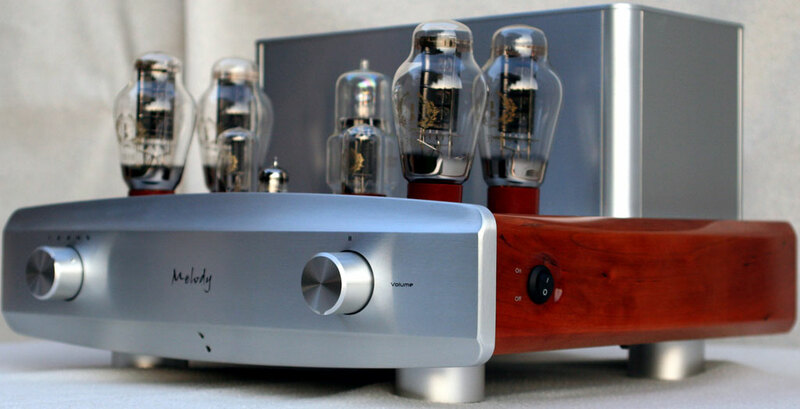 Those tubes are amazing, and it’s much easier to get great sound out of them. I’m just checking in again with you if the Melody Intergrated 300b is either a push/pull or a parallel design. 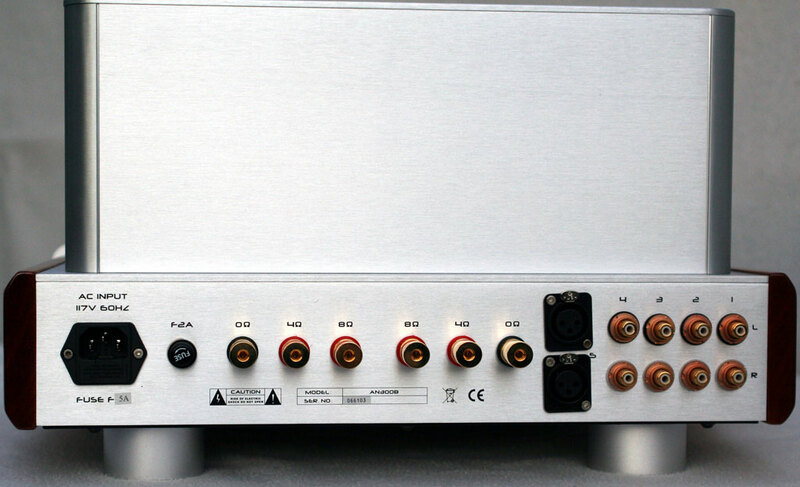 I have been getting E-mails from my readers wondering what is the truth regrading this amp’s design. Either way its a beautiful sounding piece and seems to have great headroom and dynamics to go along with that 300b magic of tone and spacial qualities. Sorry for the delay. It’s been a while now, and I cannot remember if I asked the importer, or found a bit of advertising on the internet. I went back to my notes and can’t find anything. It wouldn’t be unusual for it to be a single ended design. It sounds like it’s single ended. If I had the amp here, I’d look at the circuit. Matter of fact, that might be what I did (turn it over and look–if the two grids are wired together, it is single ended). Man, there’s been so many amps come through here, it’s become a blur. 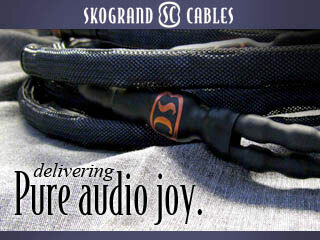 22 watts wouldn’t be an outlandish amount for parallel single-ended since many amps sporting a single 300b are rated from 8 to 12 watts. If the amp was running class AB push-pull, you could get more than 22 watts. Perhaps 25-27. It depends on plate voltage and drive capabilities. You can always ask Hugh and he can ask the manufacturer.